The moment Coleraine's challenge to Linfield faded when Davaid Ogilby was sent off for a non-existent challenge. Despite Linfield's Waterworth informing the referee there was no contact, Ogilby was harshly sent to the dresing room for two yellow cards. 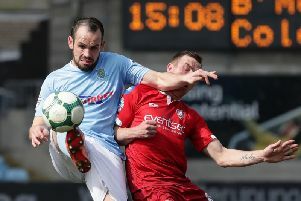 Referee Tim Marshall drew the wrath of Oran Kearney after his controversial sending off of David Ogilby in Saturday’s defeat to Linfield. Marshall produced a second yellow for the big defender midway through the second half with the game tightly poised at 2-1. However, It was a somewhat harsh caution for Ogilby as he clearly pulled out of the challenge with the onrushing Andy Waterworth. To make matters worse for the Bannsiders the visitors grabbed a third goal by Jamie Mulgrew from the resulting free kick to wrap up the points. “It’s probably the first time I haven’t gone to shake the hand of a referee at the end of a game because probably at that time I would have picked up a four or five game ban,” Kearney told Times Sport after the game. “I’ve cooled down a bit now, but probably at the same stretch it’s a very hard one for us to take. “We can take loads of positives out of the game. I’ve just said to the lads in the changing room we played so well to get ourselves in front, but I’m disappointed with the manner of the two goals we conceded. “At 2-1 at the break, and especially how the second half was going, I felt we were well in the game. “The sending off has a massive impact on things though. For me Linfield should have had a sending off ten minutes prior to that if a yellow card had been handed out to Chris Hegarty for a two footed tackle two minutes into the game. “It’s a yellow card in any league in the world. “After 60 minutes it should have been 2-1 and they being down to ten men and it would have been game on for us to try and get something from it. “Instead it pans out the opposite for something, which to be fair to Andy, he stands up and tells the ref straight away ‘OG’ didn’t touch him. The Bannsiders had made an impressive start to the game and took the lead on 23 minutes as Rodney Brown headed in a great cross from Brad Lyons. Unfortunately silly mistakes at the other led to goals from Aaron Burns and Matthew Clarke. Kearney though was full of praise for his young charges. “The reports we got on Linfield was that even though they had won their first three games teams had caused them problems, especially through the middle,” added the Bannsiders boss. “That’s what gave Jamie the nod over James today as we wanted that pace and someone who could run in behind. “The plan wasn’t to go down the sides as much but to go through the middle. “Obviously it changes when you go down to ten men and it makes Jamie’s job more difficult, but I look at his progression in the space of a season, and for him to come in with such maturity today, and Brad to come in after 20 minutes and play with such intelligence was fantastic. “We did the hard things well but it was the simple things like an unopposed clearance and ball watching have killed us. “Our young players showed up well though which is pleasing.